Captains Cottage01263 715779work01603 870304fax Self-cateringThis modern property has been recently built, providing a warm and comfortable stay in the North West Norfolk Coast. With plenty to do here, guests can enjoy the numerous paths that weave through conservation areas whilst they take in the beautiful wildlife and scenery. This property has a fantastic south-facing rear garden with barbeque and furniture, not to mention the great view of the Norfolk countryside. Captains Cottage offers weekly bookings starting on Saturday. Captains Cottag offers weekly bookings starting on Saturday. 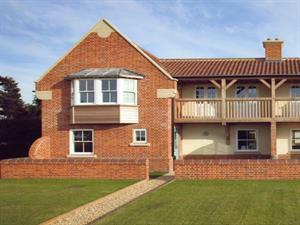 This modern property has been recently built, providing a warm and comfortable stay in the North West Norfolk Coast. With plenty to do here, guests can enjoy the numerous paths that weave through conservation areas whilst they take in the beautiful wildlife and scenery. This property has a fantastic south-facing rear garden with barbeque and furniture, not to mention the great view of the Norfolk countryside.